The VEEMUX® DVI Video Matrix Switch routes video from up to 32 single link digital DVI video sources (computers, DVD players, satellite receivers, etc.) to up to 32 displays (LCD monitors, Plasma screens, DLP HDTVs, projectors, etc.) and stereo audio speakers (with audio option). 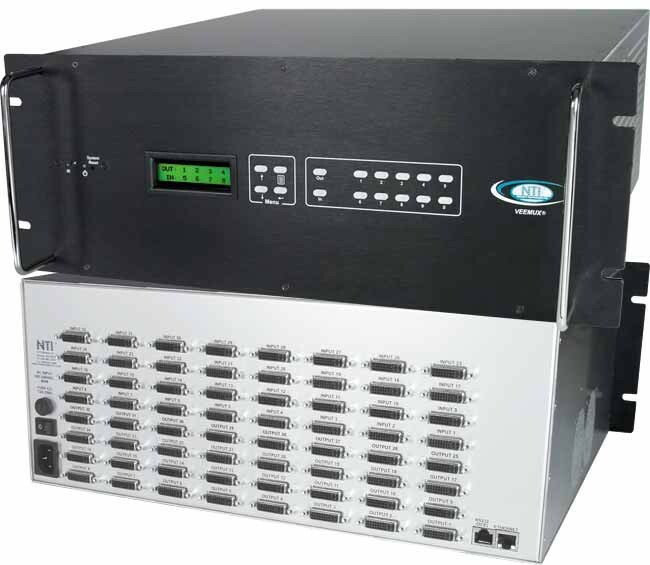 Also known as: DVI matrix switch, DVI router, video matrix switch, video router, routing switcher, video switch, video port router, multiplexer, matrix switch, video switch, video matrices. Switch page : allows the user to connect any input to any output, save and recall up to ten connections. Administration pages : administrator can access setup pages, port setting page and update firmware page. Assign names to video and audio inputs and outputs. Password page : allows the user to change the password for accessing the web interface. Help page : review documentation on the usage of the web interface. Update web server page : globally update the web server to any settings that have been changed. Logout page : view currently active connections and logout of the web interface.